This Cheesecake is Wired! | What Smells So Good? I don't think I've ever met someone who has been to a Caffe Demetre in the GTA and didn't fall immediately in love with at least one of the offerings there. The first time I set foot in there I was with my two best friends James and Heather, and the three of us have gone back several times since. I even spent a few memorable occasions there with my Reach for the Top team at the end of the season, where I almost fell into a sugar coma after trying to eat a slab of Double Chocolate Fudge Cake, complete with their freshly house-made Honey Vanilla Ice Cream and Chocolate Drizzle (known as the Fridges of Madison Cownty on the menu). If you go for nothing else, seriously, go for the ice cream. It is beyond divine. But I digress. I bring up Caffe Demetre because one of my latest creations was inspired by a specialty coffee drink of theirs: the Chocolaccino. Before getting sick it was beyond a doubt my drink of choice. Espresso, steamed milk and chocolate, with whipped cream, a cherry and chocolate drizzled on top? Thee still my beating heart (and not from a heart attack)! This creamy wonder combines a crisp mocha-flavoured cookie crust with rich dark chocolate and more espresso. For my mom's peace of mind, and my diabetic stepfather's sugar levels (not that he cares), I went out and bought No Sugar Added semisweet chocolate for this cake. I also used Splenda in place of white sugar, replaced the rest of the white sugar with brown (for flavour depth, and would do again when re-making this) and used two blocks of "lite" cream cheese mixed with one block of the regular type. But don't be fooled... this is by no means diet food (full NI is after the recipe). This is seriously rich, decadent, powerful chocolate-espresso bliss. 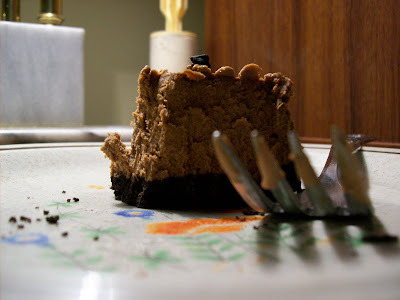 Don't make the mistake my mom did and cut it into 8ths... she was only able to eat half a slice, so a 16th is plenty for that cheesecake craving! Hopefully I get to save a piece each for my dad and Andrew, if I can wrestle it away from my mom! Caffeine and chocolate is a dangerously addictive combination! Preheat the oven to 400F. Mix the crumbs and coffee until thoroughly moist. Press the mixture evenly onto the bottom of a greased 9-inch spring-form pan. Bake 10 minutes and refrigerate until cold. Whisk together the cornstarch and cold water until blended. Beat in the egg and instant espresso, and set aside. Beat the cream cheeses, Splenda and sugar in a large bowl with an electric mixer or paddle attachment until well blended. Add the coffee mixture and mix until blended. Beat in the melted chocolates and milk. Pour the mixture over the crust. Bake for 45 minutes, or until the center is almost set, in a water bath. Turn off oven and allow to cool inside, without opening the door, 45 minutes. 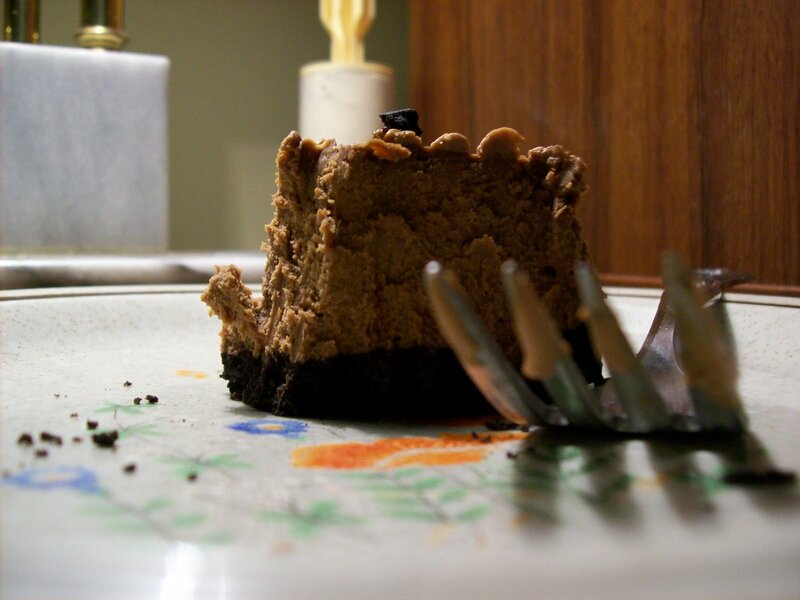 Cool the cheesecake completely on a wire rack, then run a knife or metal spatula around sides of pan to loosen cheesecake. Refrigerate, uncovered, at least overnight before removing sides of pan and serving. To serve, remove sides of pan and allow to stand out 30 minutes to come to temperature.